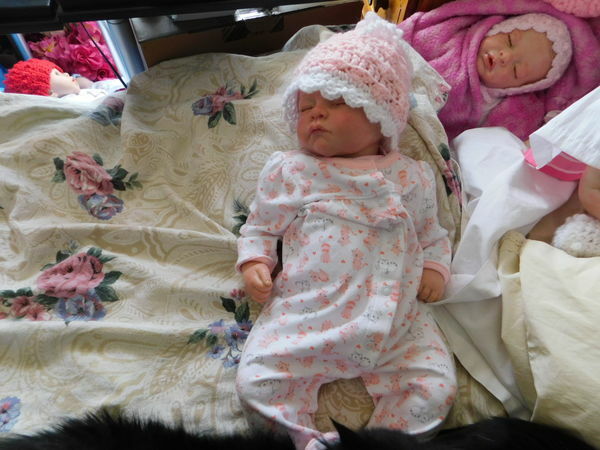 Here are two on my babies in their bonnets/hats I have made--both the dolls and the bonnets! Crocheted designs (unpublished) of mine. I still design all the time, but I feel that for the past 3 years that my mind has a mental block from going through all this cancer crap for so long. I really get and keep cheered up by painting baby dolls to look as real as I can and design and make things for them! Always good to see your work. The bonnets are so delicate. Dolls are priceless. So sweet. The babies are beautiful. Hopefully you will feel better soon. I had to do a double take when read they were dolls!! WOW! Beautiful!!! They are so sweet you really are a pro at it well done! Your work is outstanding. What sweet little dolls - nothing cuter than a pretty, feminine bonnet. I hope your cancer crap is over for good. Great dolls! I thought they were real babies!